Wine World founder Chan Cox (right) and his business partner, Robert Montgomery (left), have created a growing empire of on- and off-premise venues in the Florida Panhandle. Their partnership has been a successful one. Wine World boasts annual sales revenue of roughly $12 million, while the on-premise locations contribute another $12 million in combined sales. Across Wine World, the three Wine Bar locations, and four Craft Bar units, the pair employ a combined 250 workers. For their cohesive collaboration, commitment to customer service, and decades-long support of the local community, Cox and Montgomery have been named 2018 Market Watch Leaders. Wine comprises nearly half of all sales at Wine World, with Provençal rosés (shelf pictured) among the bestsellers. 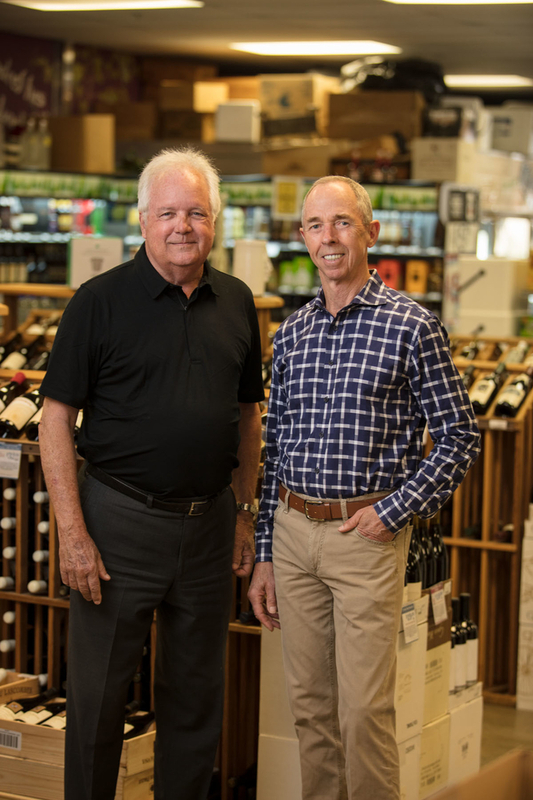 While Cox and Montgomery previously partnered on a restaurant and liquor store in Pensacola, the first Wine World unit opened in 2000 in Destin, further east in the Florida Panhandle. In the next several years, three more full liquor stores were added—in Fort Walton Beach, Panama City Beach, and Miramar Beach—while the beer and wine shop in Santa Rosa Beach opened in 2010. As a result of his growing reputation as a savvy wine retailer, Cox was invited to join the prestigious Wine & Spirits Guild (WSG) three years ago. Wine is the top driver at the retail stores—which range in size from 3,500 to 8,000 square feet—accounting for 49% of sales, followed by spirits at 32%, beer at 10%, and miscellaneous items at 9%. Wine World offers some 1,300 wine SKUs, priced from $6 to $6,500 a 750-ml. “Our most popular wines tend to be soft reds,” Cox says, pointing to The Prisoner red blend ($40 a 750-ml. ), The Culprit red blend ($16)—available through the WSG—and the 2014 Carter’s Lot Pinot Noir ($23), one of the chain’s private label wines. The stores’ Wine World Direct offerings have been successful as well. According to Cox, the private label wines account for about 40% of wine sales at the flagship Destin store. In addition to red blends, Old World wines are becoming more prevalent, while rosés, particularly those from Provence, continue to surge. 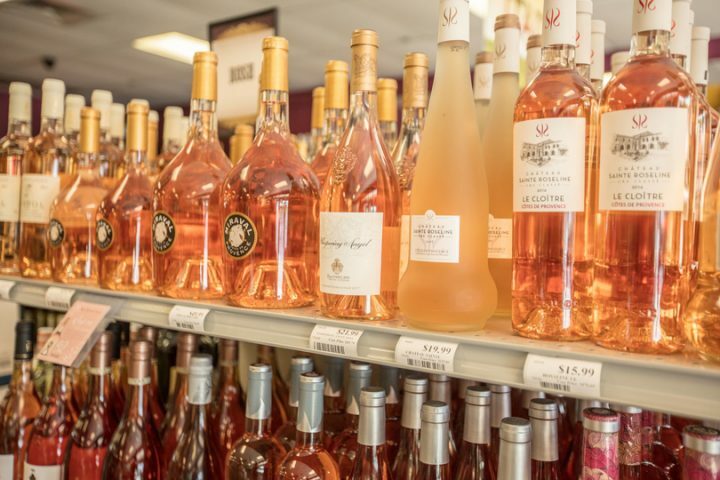 “Rosé is the perfect wine for the Florida climate year-round,” Montgomery says. 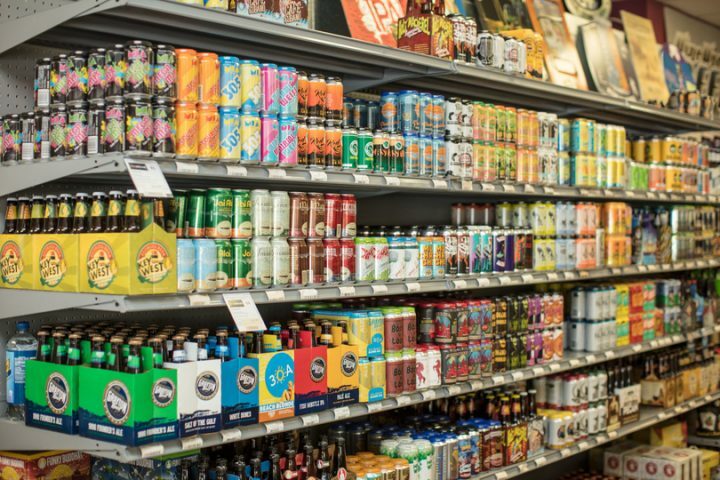 Wine World offers more than 1,500 beer SKUS, with craft beer (shelf pictured) the chain's major beer focus. The chain stocks about 1,100 spirits SKUs, priced from $8 for Taaka vodka to $2,800 for Louis XIII de Rémy Martin Cognac. Cox notes that craft spirits are among the hottest items at Wine World and transcend all categories, including whisk(e)y, vodka, rum, gin, and Tequila. “Tito’s vodka ($33 a 1.75-liter) tops the list by a long shot,” Cox says of the stores’ top-selling spirits brands. “We like to think this is a testament to the value of craft spirits.” Other top-selling spirits at Wine World include Jack Daniels and Crown Royal (both $40 a 1.75-liter). The stores’ exclusive barrel selections ($25-$90 a 750-ml. ), meanwhile, have been well received by customers, the retailer notes. Recent popular offerings include Old Weller Antique 107 ($35) and Blanton’s ($70). “We’re constantly turning over barrels,” Cox says. Wine World offers more than 1,500 beer SKUs, priced from $1 a 12-ounce bottle of Red Stripe to $43 for a 750-ml. of De Struise Brouwers Black Damnation. While the stores stock major domestic brews, they’re not its focus, as those beers are prevalent in local grocery and convenience stores. “We got a big head start on the craft beer movement,” Cox says. 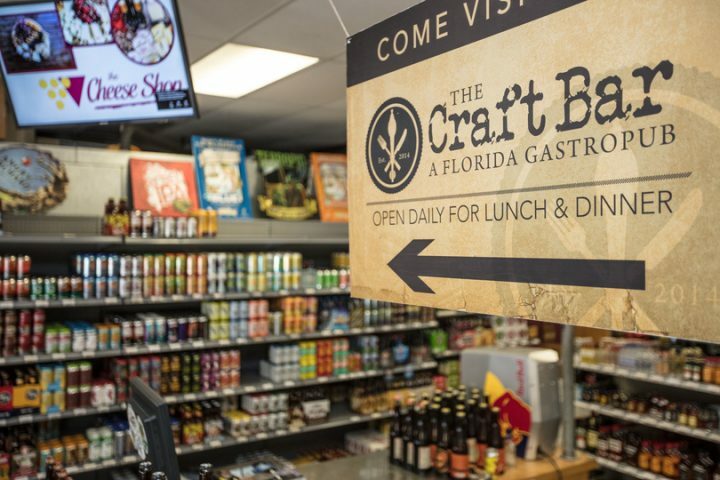 “And even though craft beer is everywhere now, we’ve held on to our business.” Top-selling beers at Wine World include MIA Mega Mix pale ale, Cigar City Jai Alai IPA (both $12 a 6-pack of 12-ounce cans), and Idyll Hounds’ Divide & Conch’R IPA ($14 a 6-pack of 12-ounce cans), all produced in Florida. Miscellaneous items featured at Wine World include cheese, chocolates, crackers, meats, and other specialty food items, as well as glassware and Yeti products. “We have gift baskets available all the time,” Cox says, adding that custom baskets are also offered. 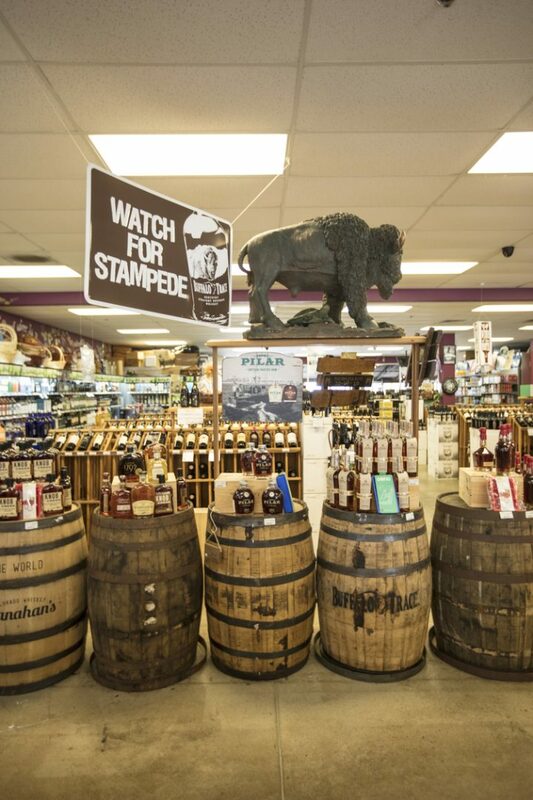 Among Wine World's 1,100 spirits SKUs (Bourbon display above) include the store's exclusive barrel selections. Wine World has built up a number of tactics to effectively merchandise its selection. Cross-merchandising cheese with wine, for example, has helped the chain generate higher rings. The stores promote a “20/20” program on Thursdays, whereby customers can receive 20% off the purchase of cheese if they spend $20 on wine or vice versa. The wine department is organized by country of origin and then varietal, with a large area of lay-down wines, priced $20 and up, surrounded by gondolas of wines under $20. 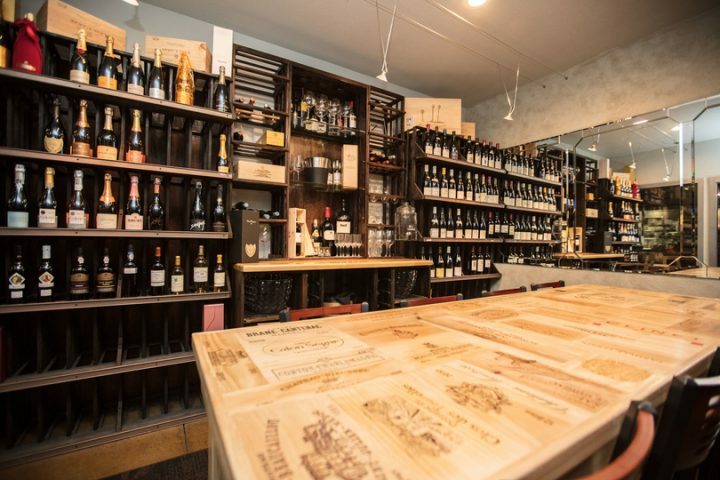 The Destin shop features a 140-square-foot fine wine cellar where private dinners and tastings are frequently held. Chilled beer is housed behind as many as ten cooler doors. Wine World streamlines shelf tags and uses only its own, which are created in-house by a full-time graphic artist. “We don’t put up a lot of commercial merchandise in our stores,” Cox explains. “We like to do our own thing.” But more important than any merchandising tool, claims Cox, is store cleanliness. “It’s an absolute requirement of mine,” he says, pointing to research that has found that store cleanliness is more important to female shoppers than prices. Most of the chain’s advertising support these days is digital, including social media posts via platforms like Facebook, Twitter, and Instagram. Wine World also boasts a robust email program with some 25,000 contacts and counting, all of whom have signed up for newsletters, event invitations, and other offers from Wine World and its sister on-premise venues, according to Cox. But he notes that the company’s email strategy is based on “segmenting groups to make sure people only get the kind of emails they enjoy.” For example, a wine offer may go out to 10,000 of its customers, while word of a highly allocated wine arrival may only be delivered to 400 customers. Earlier this year, the company launched its first loyalty program, allowing customers to accrue and redeem points at its on- and off-premise stores alike. At the original Wine World in Destin, private dinners and tastings are frequently held in the fine wine cellar (pictured). And thanks to the Wine Bars, Wine World doesn’t have to rely upon scheduled in-store tastings to drive customer trial. “Our Wine Bars have 40-plus wines by the glass. Anytime we’re talking to a customer about a wine, we can just walk over to the wine bar and offer him or her a taste. It’s a big help,” says Cox. Beverage alcohol represents at least 40% of sales at both the Wine Bars (Destin, Miramar Beach, and Santa Rosa Beach locations) and the Craft Bars (Destin, Miramar Beach, and Panama City Beach locations), Cox says. The Wine Bars feature 40 wines by the glass ($7-$18 a 5-ounce pour) and bottle ($22-$60), with the offerings dominated by Wine World Direct labels. The Craft Bars, meanwhile, boast 150 spirits ($7-$50) and 30 draft brews ($5-$20 for pours ranging from 10-16 ounces), which are also available in 32-ounce crowlers ($6-$15). A Craft Bar is scheduled to open in Fort Walton Beach in January 2019. The duo's next plans include a Wine World, Wine Bar, and Craft Bar (Destin Craft Bar sign pictured) in Pensacola. Cox and Montgomery are nowhere near finished building their business. They’re planning a major project in Pensacola—the city where they first teamed up—that will include a new Wine World, Wine Bar, and Craft Bar. Montgomery says he hopes construction will commence next year, with completion set for 2020. While that venture will be the company’s largest to date, Montgomery doesn’t think that it will be its last. “If another opportunity comes along that we find to be irresistible, we probably won’t resist,” he says.